A new law in California would make it legal for Chevy Volts to use parking spots equipped with electric chargers. But does the law actually make it harder for electric car owners? GM has a vested interest in the electric vehicle industry–the company pioneered the sector in 1996 with the EV1, the Chevy Volt extended range EV is one of the most prominent electric cars on the market, and a plug-in hybrid Cadillac is also coming down the line. 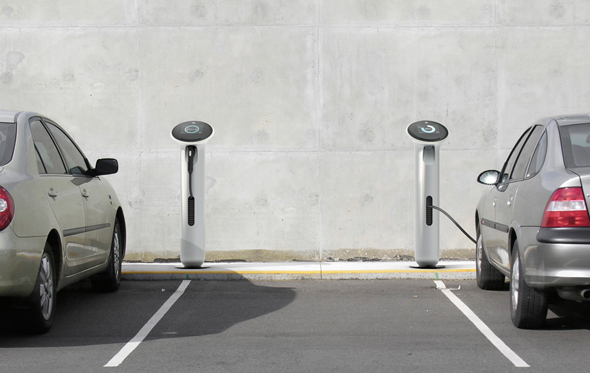 So it made sense that the company decided to sponsor California’s AB475, a bill that would restrict EV charger-equipped parking spots to EVs or plug-in hybrids (in the past, only pure EVs could occupy the spots), giving Volts a prime place to charge. But at some point, something went awry, and now GM is at odds with Plug-In America, an electric and hybrid car advocacy group that says AB475 will hurt EV drivers. Ever since 2002, California electric vehicle owners that want to juice up in parking spaces equipped with charge spots have been required to display a DMV sticker proving that they actually have a zero-emissions vehicle. AB475 aims to simplify the process by nixing the DMV stickers and allowing the parking spots to be used “for the exclusive purpose of charging and parking a vehicle that is connected for electric charging purposes.” This means that plug-in hybrids can also use the spots–but Plug-In America worries that such loose wording will allow all sorts of cars to take up the spaces with charging ruses. out of the hood and plugged in because they wanted the parking space,” says Jay Friedland, Legislative Director of Plug-In America, who opposes the bill as it’s currently written. GM says that this simply isn’t the case. “The charging equipment [features] a standard connector, and you can only plug in electric vehicles for charging a battery,” says GM representative Shad Balch. And unless people are seriously desperate for parking spots, chances are that they won’t bother to plug in their gas-powered vehicles in an EV space. One of Plug-In America’s other accusations is far more damning. The group notes that under AB475, every vehicle parked in a designated EV spot must be plugged in to a charger at all times. This means that two parking spots can’t share a charger, and that an unplugged EV parked in a charger-equipped space could be towed. In many places, the law could diminish the EV charging infrastructure. charging they can move the cord to the other vehicle. You can survive with half the amount of infrastructure,” argues Friedland. run into issues of tampering and unplugging,” says Balch.